Above: Reconstruction of a Teratorn. The task at hand is simple: just browse through the following three short news articles (only the second one of which actually appears in the Sign file). Then consider Dr. J. Allen Hynek's (astro-physicist consultant to the Air Force) brief analysis and conclusion. Next, place yourself in the position of an Air Force investigator, and post your own theory, (including whether you agree with Dr. Hynek). But the task at hand here is beta testing, and so this post is presented solely to beta test the page format and layout -- although admittedly it is a fun story. Left: Shoshone rock glyph of the Thunderbird. 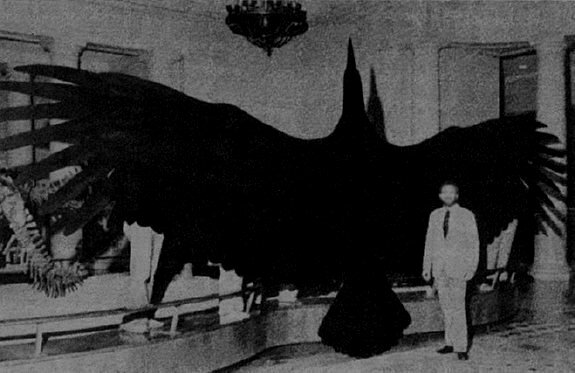 IT IS KNOWN without question that giant birds once roamed the skies. Known as Teratorns, the fossils of the largest -- known as argentavis magnificens -- is believed to have soared along the thermal currents using a wing span of 20 to 25 feet to support its 150 pound mass, dominating its airy realm six million years past. 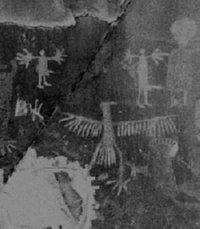 But there are a profusion of modern legends of giant birds of prey as well, the best known of which is the Thunderbird -- who was said to carry off buffalo and whose flapping wings were believed to cause thunder. Because the article was published in the Dayton, Ohio paper, where Project Sign was located, it was natural that it would come to its attention. And since it was headlined 'Companion to Flying Saucer' -- and especially since one of the witnesses was the former commander of an Army air base -- someone probably thought better safe than sorry, and gave it a file of its own. But Project Sign conducted no actual investigation -- which did not deter its successor, Project Grudge, from conferring on it a solution, as provided by consultant astrophysicist Dr. J. Allen Hynek. And that explanation would also be the official Air Force solution when Grudge's successor, Project Blue Book, closed up shop in 1969. Belvidere, Ill., April 9 (UP) - A farmer and a truck driver reported today that they had seen a bird "bigger than an airplane." Col. W.F. Sigmund, former commandant of the Army air base at Kearns, Utah, said he observed the creature at about 11:30 a.m. last Sunday while horseback riding four miles north of Alton, Ill.
And for a while, it was filed and forgotten (except for the official Air Force 'solution'). 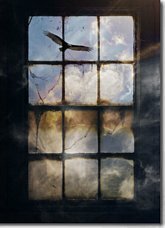 ALTON, Ill. - (UP) - An "enormous" bird, first reported sighted two weeks ago, was seen flying over the outskirts of Alton shortly before noon yesterday. E.M. Coleman, a former salesman, and his 5 year-old son, James, said the bird was flying at about 500 feet and "cast a shadow the same as that of a Piper Cub at the same height." Coleman said James and some of his friends were planning to search the area, along the Mississippi River, where the bird appeared to have alighted today in the hope of finding some trace of it. There is nothing of astronomical character in this incident. If one considers Colonel Siegmund's statements apart from the considerably less reliable ones of the other observers, it would seem that the object may really have been a bird. 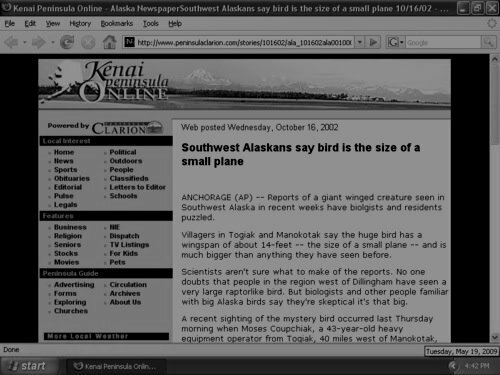 Curiously, the bird's reported immense size went unremarked. Above: "Giant bird" sightings continue even today. AND THERE you have it, with considerably more information than either the Air Force or Dr. Hynek had to work with. Their official solution was that the flying thing -- as large as a small airplane -- was a bird. 1. According to the April 18, 1948 edition of the Charleston, West Virginia Daily Mail the Belvidere Bird was in fact a glider: "Saturday, Bill Gesell of Belvidere, another of those who saw it, put his foot down on the tale and said it definitely was an airplane-towed glider. Veryl Babb of Freeport, the truckdriver, said he had to agree."